Should Christians vote? What does the Bible say about Christian involvement in political activism? In this helpful article, Dr. A. J. Higgins M.D. (New Jersey, USA) addresses this emotive subject in measured tones, applying clear-headed thinking and sound exegesis of relevant Scripture texts. Should a Christian become involved in the political world? Is our calling as “salt” a directive to stem the tide of evil by use of the ballot box or the involvement in legislative policy and practice? What should we do when a “religious” candidate is running against a very “secular candidate”? The premise is that politics control culture. But what if the truth is that culture controls politics? The gospel can influence culture; but we have done a poor job in influencing the culture via politics. Then, there are occasions when a government, state or municipality wants the “opinion” of its citizens on an issue and calls for a referendum or plebiscite. Should believers express their views in this manner, recognizing that it is not actually “voting” for a candidate? The pressure for political involvement is perhaps strongest in the USA, where evangelical Christians are a formidable voting bloc, normally aligned with conservative causes and candidates. Evangelical churches tell their congregations that it is their moral obligation to vote and to elect those who endorse a conservative agenda. Failure to do so is labelled as irresponsibility and worse. W e are chided with the reminder that all that is needed for evil to triumph is the silence of good men! In the past, many arguments were raised against believers being involved in the voting process. We were told that, if we voted for a candidate who eventually lost the election, we had voted against the will of God. That reasoning, when extended to other areas of life, becomes weak and shallow. 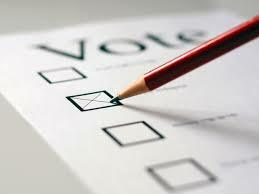 Others have simply said that their “candidate” was not on the ballot, and would wait until He came to claim His place. This argument certainly has merit. We are reminded that our citizenship is in heaven (Phil 3:20). Yet others in evangelical circles counter by pointing out that Paul appealed to the centurion on the basis of his Roman citizenship (Acts 22:25). How do we resolve all of these seemingly conflicting claims? As with every decision, the Word of God must be our guide. Much of the impetus for Christians to be involved in political activism can be traced to a misunderstanding of our place in the world. Replacement theology or Covenant theology, which is experiencing a resurgence in some circles, sees the church as so influencing the world that we prepare the world for the return of the Lord to reign. All thoughts of the Rapture, Tribulation and future for Israel are spiritualised to the blurring of the clear “out-calling” of the believer in this present age. As a result, the Christian is encouraged to go back into the world to make it a better place, prepared for the return of the King. In contrast, we await the Rapture and anticipate the increasing corruption of a world descending into the abyss of its own darkness (2 Tim 3:1-13). We must always be reminded that the Most High rules in the kingdom of men (Dan 5:21), and has never relinquished His authority. This does not necessarily mean that we are passive spectators of the political process. But it does tell us that God, at times, sets over kingdoms the “basest of men” and not always the most upright and ethical candidates. The tragic flaw in democracy, despite its many blessings which we enjoy, is that people will ultimately get what they want. If the majority wants something morally evil, it will vote it in. We are taught by Paul’s eloquent and insightful message in Acts 17, that God establishes the very time boundaries for nations and kingdoms (Acts 17:26). His sovereignty in the affairs of nations cannot be denied. He is still “King of [the] nations” (Jer 10:7). Those who lobby for Christians to be politically involved are quick to point out that divine sovereignty does not negate human responsibility. God has allowed us free will as moral agents and is able to redirect even our failures to further His purpose. But we are not left to the arguments and counter-arguments for guidance. There are several key passages which tell us of our responsibility to governments. In 1 Timothy 2, perhaps the main passage, we are told to supplicate for kings and all that are in authority. Our major influence in the political arena is found in the closet of prayer, and in the collective prayer of the assembly. For a believer to go to a voting booth and never to have visited the place of prayer on behalf of stable government is to disregard the emphasis of Scripture upon our privilege to influence government by prayer. While “voting” for a Roman emperor was not the fashion of the day, prayer is always “in season” and the priority for a believer. The assembly prayer meeting is the place for political involvement; but that involvement is seen at the throne of grace. Paul gave instructions to Titus concerning the behavior of the believers in Crete. Once they were characterized as lazy, lawless, and liars. Their redemption and regeneration brought about a change. Their lives were now to be different (Titus 3:5-7). Now they were to be serving the welfare of others in society and to be obedient citizens. They were even reminded not to speak evil of rulers (Titus 3:2), or any man for that matter. Certainly, political activism feeds on the verbal barrage thrown at candidates by those who oppose them. Political statements favoring candidates on Facebook pages and from the pulpit, or, worse still, critical comments made in the social media or from our pulpits will do little to win the unsaved to the person of Christ. These will likely only elicit a knee-jerk response from them and alienate them if they happen to differ with what has been posted or said. In his teaching in Romans 13, Paul not only stresses the appointment of men to office by a higher power, but also our responsibility to honour them and to submit to the ordinances, provided they do not conflict with the commands of God. Fortunately, the Spirit of God, through Paul, has instructed us to pay taxes to those to whom they are due. This rules out any political activism in the form of withholding taxes from governments because we disagree with their use of our tax money. Finally, Peter adds his contribution to the discussion, admonishing us to submit to ordinances made by men (1 Peter 2:13-17). We are to honour the king (or any ruler), but to reserve fear for God alone (1 Peter 2:17). The argument can be raised with some justification that voting, as it is known in democratic lands, was not known in Bible times. The assumption is then made that if voting had been allowed, believers would have voted for the candidates who were more in line with Scriptural principles. That is a big supposition and it calls into question the adequacy of the Scriptures for all times. God has embedded in His Word principles to guide us in all the choices which would eventually be faced by the people of God in future generations. Are there such principles in Scripture? We are confronted with one before we get very far into the New Testament. Matthew 6:33 enjoins us to seek first the Kingdom of God. That is our priority. By no stretch of anyone’s imagination is any political candidate or party going to promote the Kingdom of God. The best of candidates has his own political agenda, seeks his kingdom on earth and seeks to establish his place in history. He may be religious, or court the religious vote, but he is not in the business of advancing the Kingdom of God. Matthew and Mark both end with an emphasis on what disciples should be doing – proclaiming the gospel. Political activism centers my attention in an entirely different direction, linking me with individuals who have no interest in spiritual things. Paul, in writing to Timothy, reminded him that the Lord Jesus witnessed “a good confession” when He was before Pontius Pilate (1 Tim 6:13). In that emotional and tense interview, the Lord Jesus owned that His kingdom was not of this world (John 18:36-37). So we are not voting in the kingdom of God on earth. It cannot happen at a ballot box. God will bring that Kingdom in, but by a far different means, and He will address the basic issue of sin when He does. We testify to the fact that the world is corrupt and will not improve. The Rapture is imminent and only the ultimate return of Christ to reign will bring in righteousness. And yet we seem to think that the ballot box holds a temporary answer. What of the many who served in governments in the Old Testament? There was Joseph in Pharaoh’s court, Ezra, Nehemiah, Mordecai, Daniel and Obadiah in Ahab’s court. Certainly these men were involved in government. To work for a government is far different from being politically active, championing its virtues and promoting its continuance. The involvement of the men mentioned was, in most cases, involuntary and arranged by the sovereign hand of God. No one lobbied for a place or actively sought it. When Paul appealed to his Roman citizenship to avoid a scourging, it was simply because what they wanted to extract by the scourging was information he was willing to give freely. The scourging was not necessary. At other times, he did receive scourging and must not have appealed to his Roman citizenship for exemption (2 Cor 11:24). He had stripes which testified to his suffering even though he was a Roman. Evils abounded in the days of the apostles: abortion, infanticide, persecution and corruption. Yet the apostles and the believers did not demonstrate, petition or rebel. Their focus was to change men and women and instill into them the principles of the Kingdom of God. Political involvement is a very emotional commitment for many people; the fervour and rabid enthusiasm which surrounds many rallies and meetings attests to this. There is a tremendous danger of partisan politics becoming partisan Christianity in an assembly. When we introduce political allegiance into the relationships among believers, we have a potentially divisive force at work. Not all believers are automatically “conservative” in their views on every issue. Those who are less prosperous may favour a candidate who promises more entitlements and the prospects of a redistribution of wealth. Anything which has the potential to divide believers should be avoided. We do not gather based on similar political leanings; we gather to a Person Who was rejected by both conservatives (Pharisees) and liberals (Sadducees and Herodians). He did not fit into any of their political molds! There have been occasions when political differences have “spilled over” into the assembly, to the detriment of the unity of the believers. We are called upon to let the “peace of Christ rule in your hearts to which also we are called in one body” (Col 3:15, Newberry). Nothing should be permitted to disturb the oneness of the local body. Our commission is to preach the gospel and to see souls saved – not to change society. To have as a goal the improvement of our world is to ignore its basic problem, sin, and to prescribe a cure which does not actually work. Legislation passed by well-meaning men to stem the tide of moral evil may be effective for a period of time; but we are told that evil men and seducers “will wax worse and worse” as the age progresses (2 Tim 3:13). Political activism carries the great danger of distracting us from where our focus ought to be. We have a commission, not to save the world, but to preach the gospel and rescue men and women from a perishing world. There are countries where believers are required by law to vote. Some, for conscience sake, refrain and receive a fine or other forms of reprimand from the government. Those who choose to vote view it as obeying the ordinance of the land, submitting as Paul and Peter exhort. These are personal issues decided on the basis of individual convictions. Neither the one who votes, nor the one who refrains, is necessarily sinning. Much of our Christian life is a matter of deciding between what is neutral and what is better. Those who voluntarily go to a ballot box are linking themselves with earthly hopes and promises. Many are sincerely attempting to arrest the moral slide and the tidal wave of evil washing across western lands, destroying society and family life. The tragedy is that a look in the rear view mirror will show that many of the “Christians” who have become involved in the political process have brought dishonour to the Lord’s name or have left frustrated at the process. It is likely that billions of dollars as well as incalculable man hours have been invested in trying to legislate morality in our land. The Word of God makes it clear that the task is impossible. Imagine if that same money and effort had been invested in seeing souls saved! Which would have had the greater impact on society? The answer is clear. Political activism denies what we teach.The world is hopeless without God and Christ. It diverts us from our priority of the gospel and seeing souls saved, and it has the potential to divide us as believers. Ultimately we are detoured from our greatest influence, that of prayer, in exchange for the hope that our vote will make a difference.